The Christ School ICSE was started in 2007 under the management of the Carmelites of Mary Immaculate (CMI) Fathers through a registered body “Christ Educational Society of Bengaluru”. In the beginning it was associated with Christ School (state board) and began to function as two separate Schools from May 2013. During the tenure of Rev. Fr. James Narithookil CMI as Rector of Dharmaram College and the Manager of Christ School, Rev. Fr. Joseph Rathpilly CMI, the then Principal of Christ School started Christ School (ICSE) and he had been instrumental in developing the progression of the School. Rev. Fr. Augustine Thottakara CMI was the Manager from 2008-2011. In 2011, Rev. Fr. Thomas Aykkara CMI became the Manager and Rev. Fr. Shaju Varghese P. CMI, became the Principal and the School is progressing at its fullest under their leadership. The Christ School ICSE is affiliated to the council for the Indian School Certificate Examination, New Delhi, bearing the Registration Number KA260 / 2013 on August 5; 2013.The Christ School ICSE was declared a Minority Educational institution on March 20, 2014 by National Commission for Minority Educational Institutions, New Delhi. The Christ School ICSE stands as a landmark in the abode of learning. It imparts quality education and enriches the learning environment in order to optimize each child’s overall development and help to realize its full potential. The focus is on bringing up caring, confident youngsters who will uphold moral and spiritual values and eventually take their place as productive, responsible members of society. Christ School is primarily meant to provide catholic children with sound education based on religious and moral values, but is open to all, irrespective of religion, caste or community, paying respect to their religious feelings and freedom of conscience. The school aims at not merely preparing its pupils to qualify for the board examinations but also at achieving excellence in every aspect of educational activity - spiritual, academic, cultural, social and physical - by - developing their character and personality through graded responsibility, personal guidance and social awareness, thus forming them into leaders in the intellectual and civic life of the country. 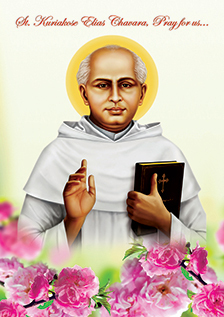 Blessed Kuriakose Elias Chavara, the founder of Carmelites of Mary Immaculate (CMI), an indigenous religious congregation, is our source of inspiration as the influence of his vision and dreams permeates through our activities today. Blessed Chavara, a great educationalist and social reformer of the 19 century foresaw the changes that would take place and wanted to build a society based on Fatherhood of God and Brotherhood of humanity.